“By their fruit you shall know them.” What does fruit have to do with anything? Fruit is one of the best ways in God’s creation to identify what we’re seeing. Try cutting an apple in half and pulling out the seeds sometime. Then cut open an orange. If I were to take the apple seed and plant it, over a period of time—at just the right season—an apple tree would grow. If you were to look at the tree that produced the fruit, you would have no difficulty knowing that it is an apple tree. You could do the same thing with that orange that I mentioned, and you would get the same result. It would be a no-brainer because by its fruit the tree is known by its fruit. It is that simple. Jesus said that you can tell a false prophet from the real one by the fruit produced. He specifically said that thorns and thistles represented the false prophet and that figs represented the good fruit. That’s interesting, because I don’t know the last time I saw a politician, poet, preacher or a clergy type growing thistles. And I don’t ever remember anyone adorned with a fig suit. We don’t want to get so literal here that we lose the point. “So what are you talking about, Jesus?” I think Jesus is talking about the type of teachings regarding the kingdom of God that a Christ follower would produce, as well as the fruit of the Spirit. We are to compare these types of teachings to the world system being taught—and the works of the flesh—that a worldly leader would teach. So let me first simply share with you a thumbnail sketch of kingdom versus world-system teachings. You will easily see the difference between the real versus the counterfeit. Then let me compare and contrast the fruit of the spirit and the works of the sinful nature. Both are being “preached.” One is authentic and the other is a counterfeit developed later. 1. Do not worship any god other than the one true God. All other gods are false gods. 2. Do not make idols or images in the form of God. An idol can be anything (or anyone) you worship by giving it more importance than God. Don’t bow down to idols. If something (or someone) monopolizes your time, attention, and affection, it has your worship. When you surrender to something, you give it control of your life. 3. Do not treat God’s name lightly or with disrespect. Because of God’s importance, His name is always to be spoken with honor. 4. Dedicate or set aside a regular day each week for Sabbath rest and worship of the Lord. 6. Do not murder a fellow human being. 7. Do not have sexual relations with anyone other than your spouse. Your body is the temple of the Holy Spirit. You belong to God and not to yourself. 8. Don’t take anything that doesn’t belong to you, unless you’ve been given permission to do so. Don’t steal. 9. Do not tell a lie about someone or bring a false accusation against another person. 10. Do not desire anything or anyone that does not belong to you. Comparing yourself to others, and longing for what you do not have, can cause problems. Be content by focusing on the blessings that God has given you and not on what He has not given you. 1. Worship any god. There is more than one path. It doesn’t matter what “God” says. 2. It doesn’t matter to what or to whom you bow…or don’t bow. Just believe. Your faith object isn’t important. You can be your own little God, if you like. 3. Say what you want to say about God anyway you want to say it. 4. Work as hard as you can for as long as you can. Neither rest nor worship is necessary. Just be ambitious. 5. Honoring parents is not necessary for living a fulfilling life, nor is being an honorable, nonabusive parent. 6. Shedding of innocent blood is OK, especially if the life is in a woman’s womb, but being against the death penalty is important. 7. It’s my body, and I will do with it what I want! If you disagree with me, then you are a sexophobic, homophobic bigot. 8. Stealing is OK sometimes. 9. Lying is OK…if it serves a good purpose, and I decide if the purpose for lying is good. 10. If people have more than I do, they should give me some of what they have. It is the fair thing to do. I want my fair share, even if they earned it, and I did not. I am entitled. Check out this list of things above that prevent a person from inheriting the kingdom of God. 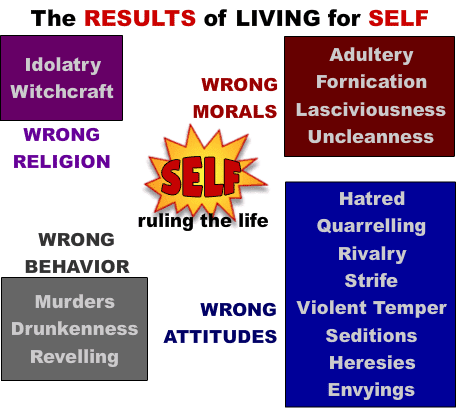 These are very similar to living “the self life.” Self life is living for myself with little regard to God or for others. The description in Galatians 5:19-21 represents people living in a different kind of zone I call a “religion-free zone.” The first thing that jumps out at me is that many of these are the things from which most forms of abuse originate. If there were no sexual immorality, there would be no sexual molestation (heterosexual or homosexual). If debauchery (unbridled immorality) did not exist, there would be none of the other abuses either. Here is some information that may get your attention. The Greek origin of the word “witchcraft” is pharmakeia. It can also be translated as “drug abuse” or “to poison with drugs.” I cannot tell you how many young adults I know, and have counseled, who were sinned against or abused while the perpetrator was under the influence of an intoxicant. Drug abuse is rampant in such cases, and there are many crimes committed while people are under the influence of drugs. Needless to say, the acts of the flesh wreak havoc in our culture; for instance, hatred and rage have taken their toll on the lives of innocent people, as they have been beaten unmercifully. Or they have been lashed with a whip like tongue that vomited verbal abuse; additionally, I actually know a young man whose mother (claiming to be a witch) verbally placed curses on him when he was a child, and she committed sexual acts against him on a regular basis. And the list goes on and on. When it comes to the works of the flesh, it really is true that by false teachers’ fruits, you can know them. The works of the flesh make up the stuff of which quicksand living is made. You may have questions after reading this far. Perhaps you wonder something like the following: Are you trying to tell me that there are leaders who would dare teach anything affirming any of these sins? Are you telling me that there are those who would indeed legitimize anything other than that which is the fruit of the Spirit or the teachings of the kingdom of God? These are all reasonable question. Rock-Solid Living In A Quicksand World.